Global Snippets are a beautiful thing. They allow you to add one rich snippet to many posts at once. But how does it work exactly? When you activate the plugin you will see a new menu item under “snip” in your WordPress dashboard. It’s named “Global Snippets”. Just open it up and add a new Global Snippet. You will then be able to create a Rich Snipppets. When you’ve finished creating the snippet, you can choose where it should appear. For this scroll down to the “Position” metabox. There you can create a set of rules to determine which pages will use these schema.org syntax you’ve just created. Go to “snip” in your WordPress dashboard and choose “Global Snippets”. A new admin notice will appear on top of the screen. It says “Hey Dude! The plugin can install some predefined global snippets for you!”. It also shows a button that says “Awesome! Install them please”. Go to “snip” in your WordPress dashboard and choose “Settings”. Scroll down to the “Actions” part. Click the “Go for it” button where it says: “Reinstall predefined global snippets.”. You should then be redirected to the Global Snippets page and should see some new Global Snippets, like the “Article”. How can I fill certain properties automatically? As you can read here, it’s possible to create properties from post content. Please take a look at the video we’ve prepared. It shows exactly how to do it. You can also use custom fields. If it’s necessary to overwrite certain values per-post: read how to make properties overridable. Can I add another snippet to a post that has a global snippet? Yes you can. Read more about this here: Can I use multiple snippets on one page? Referencing to current post content and custom ID is deprecated. How to update. In version 2.2.0 of SNIP, the Rich Snippet WordPress Plugin, there is a cool new feature that allows you to overwrite global parameters directly in your posts. Referencing to content is outdated and will not work as of version 2.2.0! Referencing from JSON+LD format to HTML no longer works. The reference shortcode will be removed in version 2.2. Please read more on how to make the switch here. Update July 30, 2018: There is currently a new schema type in development that would allow to reference something in the HTML sourcecode. It’s called CssSelectorType. However this type is currently in development and not supported by the major search engines. Once this is approved, the following information should work again as described. Why should I surround my content with a DIV? This information is outdated and no longer works. Update: July 30, 2018: There is currently a pending schema Type called CssSelectorType that would allow to use content from the current HTML page. However this is currently pending. Once this is approved the below information should work as described again. With that ID it’s possible to refer to that content in a Rich Snippet. For example if you take a look at the Article-Snippet (that comes shipped with the plugin) you can find a property called http://schema.org/articleBody. This property usually inherits the content of a post. To avoid posting your complete content into this property we can instead refer to the main content in a post via the ID so that you don’t need to worry about changing it when the main post content gets changed. 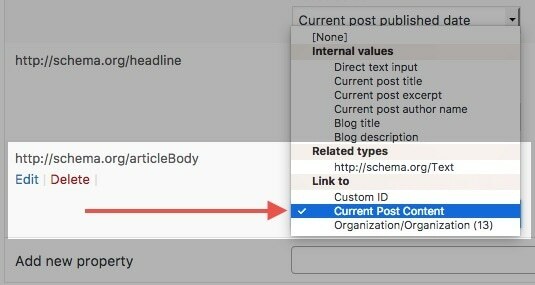 Once the setting called “Surround main content with a DIV so that it can be addressed by snippets.” is active, you will see a new option called “Link to current post content” when you select the value for the property. Refer to the content via its ID. There is a completely now Structured Data Training Course that you can take for free! Please watch the videos from the training linked above. The video below may show outdated pictures! Mein Structured Data Training Kurs ist nun online. Er zeigt auf, was struktuierte Daten sind und wie SNIP funktioniert. Der Kurs ist derzeit allerdings nur auf englisch erhältlich. Bitte beachte die Videos im Training, welcher oben verlinkt ist. Unten stehendes Video könnte veraltete Inhalte zeigen.